With this challenge in mind I favourited a few ideas from crafters and artists I follow online along with looking out photos of some of my own projects. I hope you like them and would love to see some of your ideas and of course your own projects! So think pandas, zebras, silhouettes, cats, footballs, spiders, cows, bats, skulls, shadows, snowflakes and even Darth Vader, it's time to go Black and White! Paper cutting is one of my favourite crafts and lends itself well to this particular challenge. The "baby it's cold outside" design (from totally templates) was on top of gorgeous black glitter paper and was one of my favourite Christmas gifts to make. I follow a number of instagram accounts which have incredible examples of paper cutting but my there's one in particular who only works in black and white, Mr Riu and his work is outstanding. I'd recommend a browse! I didn't think I'd made any black and white crochet projects until I stumbled across these photos of the Polar Bear and Storm Trooper hats I made. I used the same basic pattern for both from Repeat Crafter Me. Her sizes for crochet hats from newborn to adult have always been great and I love her ideas. One of my favourite places to look for pattern ideas is Ravelry, the online knitting and crochet community. There's THOUSANDS of patterns there and a lot are free. There's some really great ideas when I searched for black and white patterns and I loved seeing all the different ways to combine the two colours with stitches I already knew, zig-zags, stripes, blocks, bobbles, swirls, chevrons. I've never made a black and white blanket and now I'm suddenly excited to give it a try, in fact I've promised my nephews I'd make them football themed blankets a little like this one from crochethome. One of the many workshops I've been to (I do love a good craft workshop!) 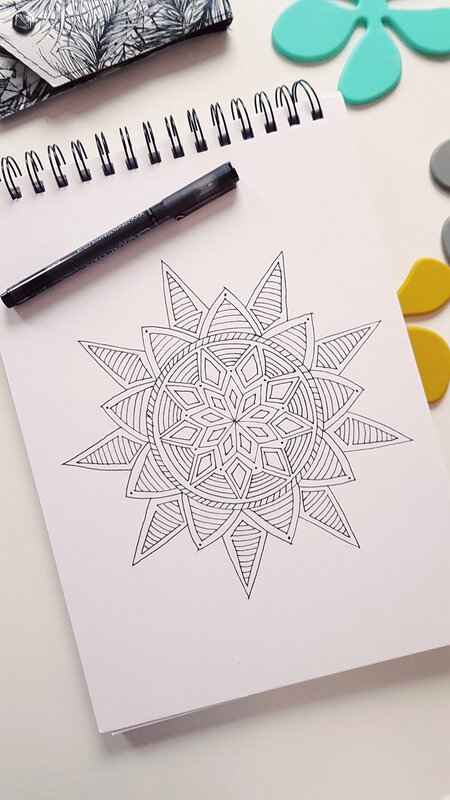 was on how to draw mandalas. My favourite thing about this is everyone very quickly had their own style going and there was no end of possibilities. Here's a photo of one of my first attempts...I love that my pen case is also black and white! 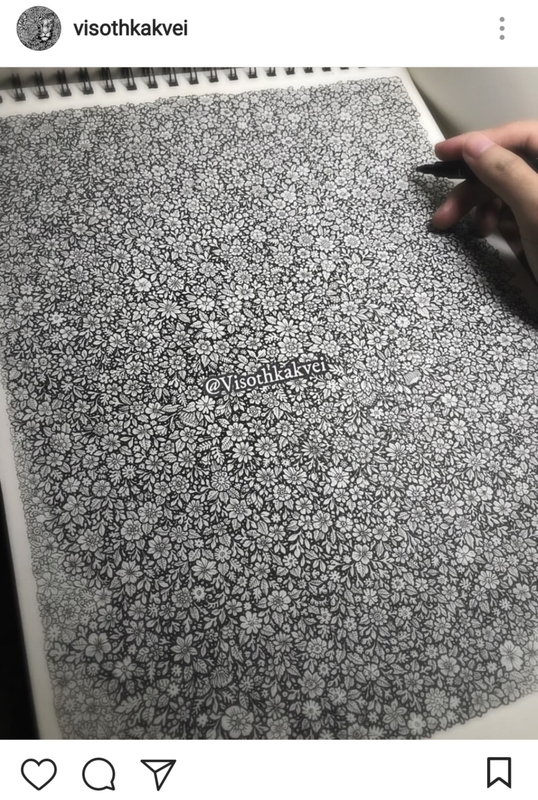 The technique for drawing Mandalas was much simpler than I realised and once you have that down, it really is just up to your own personal style. 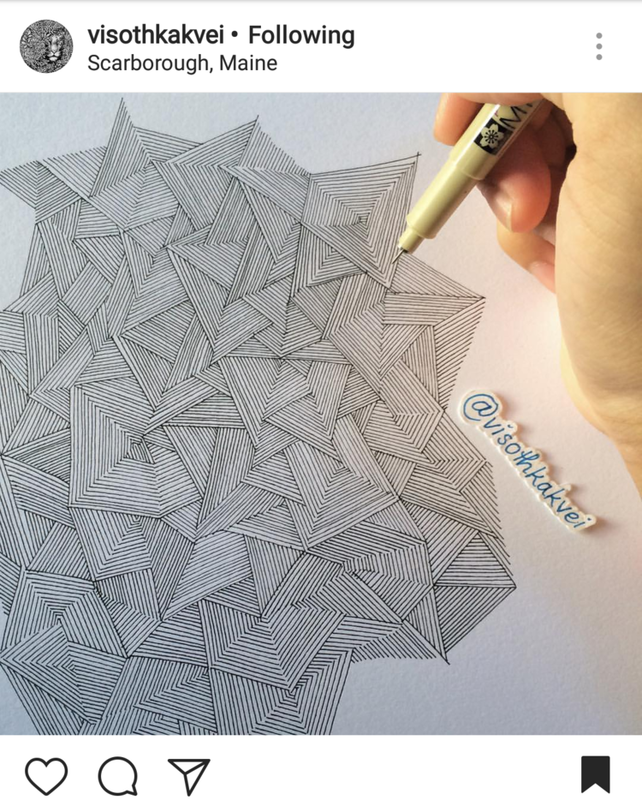 It's also quite therapeutic, a bit like a structured doodle! There are two Instagram accounts I'd like to share here Visothkakvei and Christarijn. Both work completely in black and white and create the most beautiful pieces. Visothkakvei is anything but simple whilst Christarijn creates incredible depth with a very effective technique. The last two examples I want to share show how it's worth thinking about whether you use white on black or black on white or combine them. The different effects are quite outstanding. 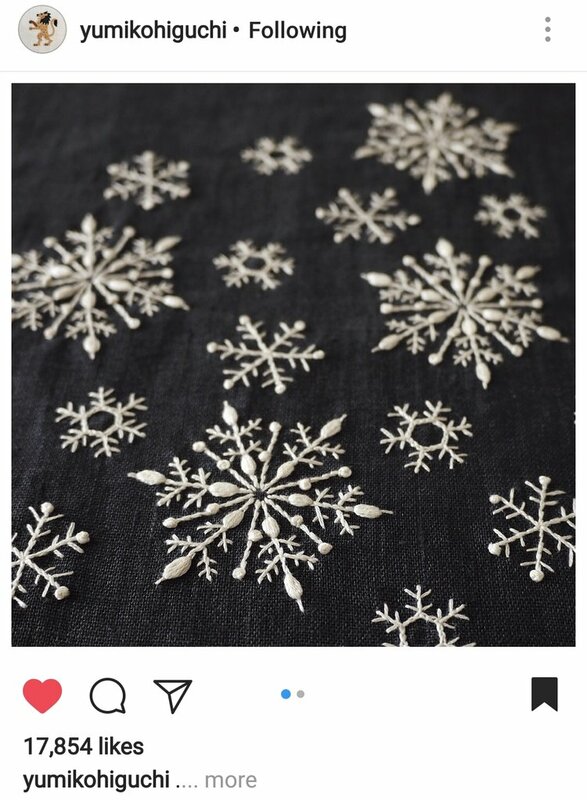 The first is a snowflake design and I just adore the simplicity of the white thread on the black fabric. Created by Yumikohiguchi on Instagram, I think this piece is probably the one that's really making me want to start embroidery the most. It's stunning. The second image is actually from a member of the Happy Barnet craft challenge group , Avvabanana on Instagram. I've watched her incredibly detailed cross-stitch of David Bowie grow and the detail is just fantastic. This might not fit exactly with this challenge title (keep it simple!) but my goodness, it is a thing of beauty! I hope you've found these ideas helpful and look forward to seeing what everyone comes up with for their black and white challenge!